We've taken the hassle out of negotiating! We offer discounts to local employers for out-of-town guests, click below to find yours. Proof of Employment may be necessary to obtain this special pricing. Book Early and Save Promotion. Know your travel plans more than a week in advance? Use our Advance Purchase program and save (Subject to Availability). Designed for VIPs and honeymooners alike, our two-room Presidential Suite also features a gas fireplace for a more relaxing stay. Located on the campus of DePauw University and just one block from downtown Greencastle, Indiana, The Inn at DePauw provides a charming, welcoming and contemporary full-service hotel for business travelers and university visitors. The Inn’s recently renovated accommodations include pet-friendly guest rooms featuring colorful and vibrant décor and all of the modern amenities you would expect from a 4-star hotel. Our guests enjoy two dining options that focus on local, fresh, seasonal items, and gourmet farm-to-table homemade soups. The original “Fluttering Duck Bar & Grill”, features a sports bar vibe, with live music and pub-style handhelds and shareables. The “2 West Bistro”, home to one of the best Sunday brunches in Greencastle, along with daily soup, salad bar and lunch buffets featuring Indiana local favorites. Guests can also enjoy a relaxing Great Room with a fireplace, a top-notch business center, fitness room and stunning event spaces for meetings, weddings and social functions. Whether you're looking for a romantic getaway or the ideal venue for your next conference, retreat or wedding in Indiana, The Inn at DePauw is the perfect choice. 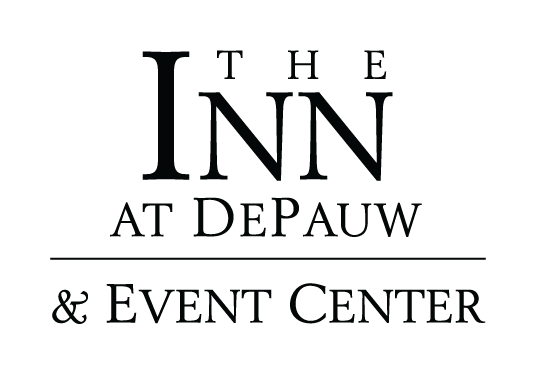 With 6,700 square feet of function space accommodating up to 300 guests, The Inn at DePauw & Event Center is the premier choice for retreats, meetings, conferences, corporate seminars and business events in the Greencastle area. Be sure to explore the area! DePauw University is not the only treasure in Greencastle. The Inn at DePauw is close to area attractions and activities that range from Putnam County Covered Bridge Trails and Indiana State Parks to Public Gardens, Local Boutique Shopping, Museums, Golf Courses, Spas, Horse Shows and Indianapolis Motor Sports.